Feet flat on floor; keep feet even with shoulders. Arms straight down at sides, palms inward. Raise both arms to side, shoulder height. Hold position. Slowly lower arms to sides. Repeat 8 to 15 times. Rest; do another set of 8 to 15 repetitions. Sit in chair with armrests. Lean slightly forward, back and shoulders straight. Tuck feet slightly under chair, weight on toes. 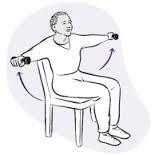 Slowly push body off of chair using arms, not legs. Raise both arms in front of you (keep them straight and rotate so palms face upward) to shoulder height. Slowly lower arms to sides. Sit in armless chair, with your back supported by back of chair. Hold hand weights at sides, arms straight, palms in. Hold position. Slowly lower arm to starting position. Repeat 8 to 15 times each arm. Rest; do another set of 8 to 15 repetitions.